Forget the auto shows in Los Angeles and Tokyo. Those are for squares. The real hotness is in China at the Guangzhou Auto Show. 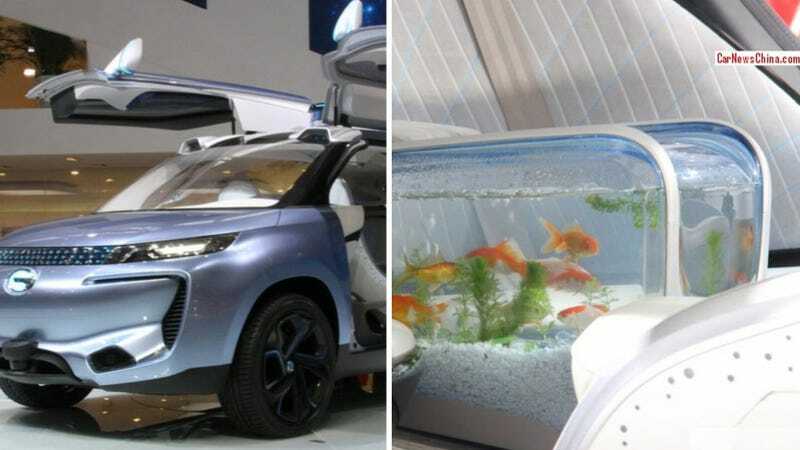 That's where you'll see concept cars like the Guangzhou Auto WitStar Concept, which has a fish tank inside. A FISH TANK. How many Chevrolets or Subarus had fish tanks in LA or Tokyo? Precisely none, that's how many. China is where you must go to satisfy your dream of in-car fish viewing. Friend of Jalopnik Tycho over at Car News China has the scoop on the WitStar, a hybrid-electric gull-winged crossover that packs a tank full of fish in the rear seat for a legitimate reason. Well, legitimate as far as crazy Chinese automaker logic goes, anyway. You see, the WitStar has autonomous driving technology. They included the fish tank to prove that the car is capable of avoiding obstacles on the road. Because a crash could break the tank and kill all the fish inside, the inclusion of the tank was done to show just how safe it is. Like I said, crazy Chinese automaker logic. I love it. Head over to CarNewsChina for more details on this amazing machine, which I hope will spur more car companies to put fish tanks in their automobiles. I'm so bored with just driving with my dog. I need exciting new in-car pet action.